Here’s something from the alpha (as in not yet beta, so please consider it work in progress) to keep you busy. Just to guide the discussion a bit, the large colored areas are spheres of influence. Spheres of influence are not quite the same as the way we think of “borders” here on our planet. They project from your colonies and define the space that you could control. Systems within your sphere of influence that you have at least explored are considered under your control. 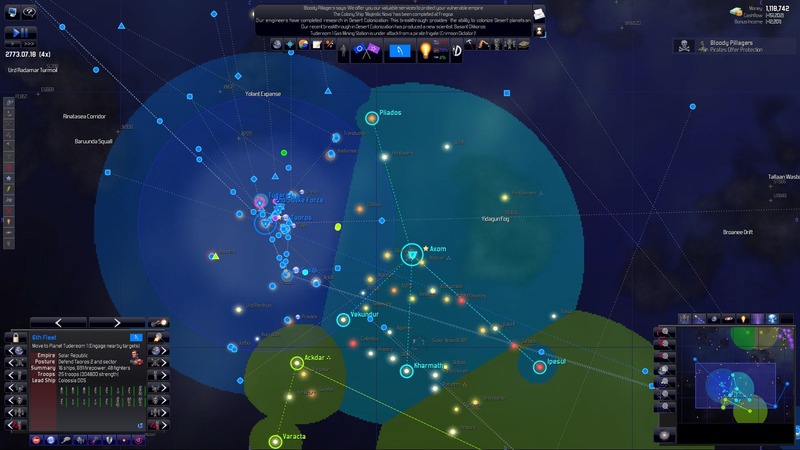 Borders in space are enforced within each controlled system but not in the deep space between systems. Also, building a mining station (for example) outside of your sphere of influence does not give you control over that system (though colonizing it does). Diplomacy has been overhauled to allow the negotiation of mining and refueling rights within your controlled systems, among other improvements. Sounds nifty! I really need to dive back into Distant Worlds. I played it a bunch when it came out but never too much, and never got around to getting the first expansion, which I may need to rectify soon. I’ll keep you updated on this story as it develops. A sphere of influence is hardly a ground breaking concept. I don't mean to poo poo the idea because I thought DW was a truly cool game. Like you, though, I never played a ton and didn't get the expansion. I have a huge backlog of games, but DW is one of the few I feel like I really NEED to play more. Totally agreed on all counts. If I start making more money, they'll be mine. I love Distant Worlds, and I have played the expansion. Still, as much as I like it, it's still missing something, somehow, in my opinion. I'd particularly like some more feedback on the trading part of the game, since I never really have a clue about what's going on there.